It has a tall mock orange with dark green leaves. Underneath it we have a gigantic rhubarb, not a good one for eating but great leaves in the garden. In the shady parts I have the same lobelia, dusty miller but have added 'Red Accent' impatiens and various colours of nicotiana Domino variety, white, purple, red and pink eye. I have transplanted my Lambs Ears (Stachys) in a few spots. In the sunny part I have added celosia 'Kimono mix', various colours. I have also transplanted an evening primrose (Oenotherea and Veronica 'blue'. I will try to find perennials that are shorter and ground covers to fill in here and there. My sister in law Brenda wants to make a stepping stone with one of the rhubarb leaves. If it ever gets done I take a picture of it and post it on the page. Mint just mint if you know what I mean. They, like Greta Garbo, want to be alone, darling. We use mint in a lot of summer dishes and drinks so we have to have it (In the recipe section I am working on there is a carrot salad with mint in the dressing). Above the mint there, on the basement window, is a long window box filled with shade annuals (I usually have another window box at the other basement window but right now it has in front of it the pile of bricks for the pathways and a new kayak waiting to find a place in the midst of all this construction, so no use in having it right now), lobelia, dusty miller, pink impatiens and coleus. I usually plant tuberous begonias but with all the new construction pending I forgot to plant them. This is also the patio area were we have a table with umbrella and four chairs a few pots here and there and the barbecue. In front of the new constructed tool shed there is a long planter box with geranium, dusty miller, lobelia, celosia (Cockscomb) ' rainbow mix' and alyssum. We are calling this Christopher Robin's House because there are other Pooh places named further on. Christopher Robin is Stephanie's favourite Pooh character, mine is Piglet and Klaus' is Pooh. 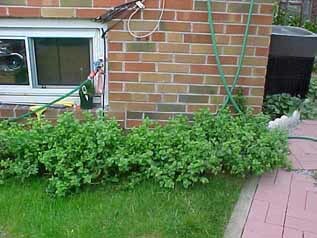 I want to plant a window box under the window and have hanging baskets at either end or bird feeders. I received the planter for my birthday and have zonal geraniums scarlet, 'Kim', dusty miller, 'Silver Dust' in the middle and 'Sapphire' lobelia and a cup flower 'Mont Blanc' (Nurembergia hippomanica) a lovely trailing plant with white flowers and yellow centres, very delicate and (bacopa) that has a tiny white flower with a trailing habit. Now with the walkway in place the tool shed real looks like a little fairy or elves's house. ..is an area with my potting bench, garden "stuff" compost bin. We are going to have a screen in front of it.We are going to have a screen in front of it. We have finished placing the concrete patio stones in this area. It was a very heavy job as the stones are 24"x30"x2" and weigh about 100 lbs. each. We now have finished the screen: 4"x4" posts and 2"x4" rails with a close lattice work on the back for a hide. I have got to find something that will grow up the screen is it painted a soft "Martha" green. ...is a new border in front of a screen to hide Eeyore's thistle patch. It has white coral bells (upon a slender stalk? :-) , blue veronica, lambs ears and delphinium (one of my favourites). In front for now I have the same lobelia, celosia dusty miller and nicotiana with an ageratum 'Hawaiian White' for the white this time. When I get more organized I will build an Eeyore's house out of sticks. We had to cut out a maple tree and I saved the sticks which I will use. Also somewhere near the tool shed will be a house for Owl. After the pond is done we want to put in a droopy cut leaf Japanese maple and two other small shrubs or evergreens. I think the perennials I have there now will have to find a new home. Ouch! The price of Japanese maples. I planted some sun flower seeds that I got when I bought a book on sunflowers. They are already up 1 foot as of July 3. July 23 sunflowers are past my waist almost up to my shoulder. In 1999 I tried planting the sunflowers again but I think Eddie and his friends ate all the seeds. We love to hear from you . Division of 1065788 Ont. Inc.